IEH Corporation is a manufacturer of connectors for electronic systems. These connectors and other components are used mainly for military and medical applications. The company employs a technology known as the “hyperboloid connector,” which is explained in a very helpful video on the company’s website. The company is based in Brooklyn, NY and was founded by Louis Offerman in 1937. Today, Michael Offerman is the company’s CEO and largest shareholder. Notably, value investor Paul Sonkin’s Hummingbird Management, LLC owns 13.2% of the company. IEH has been extremely successful over the last ten years, compounding book value per share at 26.8% annually and increasing revenues at 11.4% annually over the period. The company was profitable in every year. As the company grew its profits, it deleveraged its balance sheet and retained earnings. The company’s current ratio of 12.12 and equity-to-capital ratio of 92.68% are decade highs. Despite its recent history of growth and profitability, IEH trades at an extremely depressed valuation of 5.16 times trailing earnings and an EV/EBITDA of 2.25. Price to net current assets is 0.78 and price to tangible book value is 0.64. 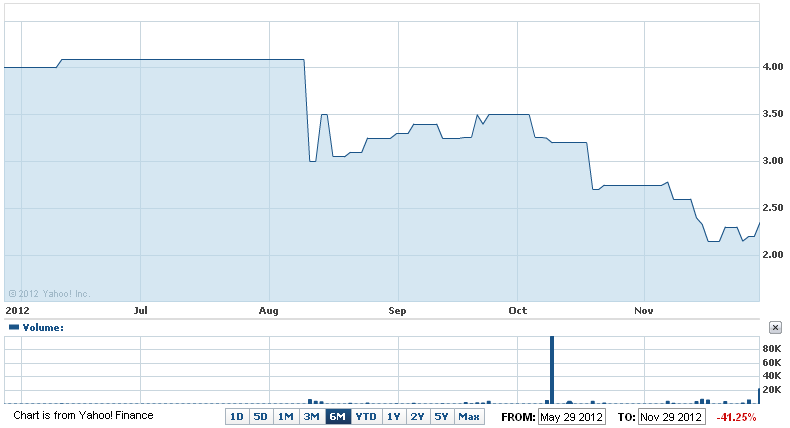 Over the last six months, IEH’s share price has plummeted 41.25%. So, why has the company’s stock fared so poorly? One reason may be the company’s relatively poor recent results. 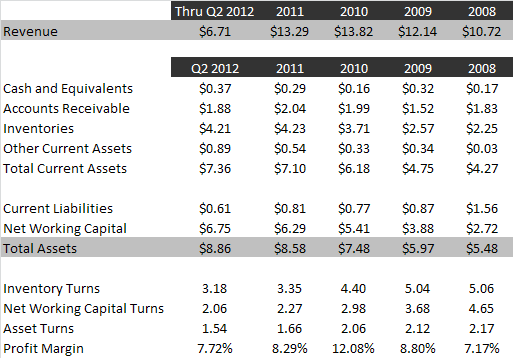 Since peaking in 2010, revenues have declined 4.6% to $13.18 for the trailing twelve months. Net income has been battered by a combination of shrinking revenues and gross margins and is down 38.9% from the 2010 peak. In my opinion, investors are suffering from recency bias, placing far too much weight on the company’s current results and ignoring its history of sales growth. A big storm cloud hanging over the company is the threat of large cuts to the defense budget. In the year ended March 31, 2012, 60% of the company’s sales were to the military market. Should the US congress fail to reach a compromise, the “fiscal cliff” could send the company’s revenues over a cliff of their own. Another significant risk is the company’s poor working capital management. Despite producing $7.35 million in profits in the 8.5 years since 2002, the company produced just $1.32 million in free cash flow. Capital expenditures accounted for only $2.13 of the difference. The rest was consumed by continually increasing investment in net working capital, inventory in particular. Since 2008, the company’s rate of inventory turnover, net working capital turnover and asset turnover have steadily declined. Continually declining turnover is a very troubling sign that indicates the company is using its assets less and less efficiently. As inventory turns decline, inventory is held longer on average, increasing the possibility of obsolescence and write-downs. Also, declining asset turnover hurts return on equity, ultimately reducing the company’s market value relative to its book value. Reducing net working capital to 2008 levels relative to sales would free up $3.87 million in cash, equal to 73.9% of the company’s entire market capitalization. Even a more modest increase of one net working capital turn (achieved by reducing net investment in working capital) would free up $2.37 million in cash. Disinvestment in net working capital can be achieved by reducing current assets like accounts receivable and inventory, or by allowing current liabilities like accounts payable and accrued expenses to increase. The latter seems doable, as current liabilities are at their lowest in the past decade. Another possibility for the company would be to take on a small amount of debt and use the proceeds to repurchase shares or pay a special dividend. Even taking on $1.1 million in debt, equal to 0.5 times trailing EBITDA, would enable the company to pay a special dividend of 47.8 cents per share, or repurchase 21% of shares outstanding at current prices. IEH faces a difficult future with uncertainties around the military budget and its recent decline in revenues. However, the company is statistically cheap enough that patient investors may see a lot to like. IEH’s excellent balance sheet and discount to net asset value should provide downside protection while investors wait for the company to get back on the right track.